Professional email signatures are more than just an electronic calling card. They can provide a serious marketing opportunity. Yet, lots of companies struggle to keep their staff's signatures consistent and in compliance with their corporate identity guidelines – without even thinking of signature marketing. With dedicated email signature software you can tackle this challenge. Email signatures should provide brief information about you; who you are, where you work and how to contact you. They often contain the sender's name, job title, company, address, phone number and other contact information; social media links for example. Email signatures should be consistent and in compliance with the company's Corporate Identity guidelines. Many corporations have internal policies requiring outgoing emails to have signatures appended to them and defining exactly which information must be included. Utilize email signatures to support marketing and increase sales. Promote new products & services, your newsletter, events, jobs, case studies, ... Considering the total number of emails sent, signatures can provide a targeted and high volume marketing opportunity. Some countries (e.g. UK, Ireland, Germany) have laws requiring companies to disclose specific information (company name, registration number, place of registration etc.) in their emails. Getting all employees to use a signature which conforms to your brand's Corporate Identity, complies to laws and reflects the marketing campaign you are running today (and not the one from last month) can be a tough job. Ok, if you have very few employees you could personally set it up their signatures and update them regularly. But, it is at least time consuming and probably frustrating too. You surely have more important work to get done. And this is where software comes in. Dedicated software helps you control and manage email signatures organization wide without giving your IT guys a headache. Create the right impression with a professional email signature. Manage and control email signatures organization wide from one central spot. Make sure every employee has the right signature(s) in Outlook, OWA or on his mobile device. Precisely control the design of your email signatures. Get consistent signatures and conform to your company's Corporate Identity guidelines. Add dynamic data from Active Directory or database. Save costs by reducing the load on staff, especially on your IT guys. There are two different types of dedicated email signature management software. Their differences, advantages and capabilities are described below. With software such as CI-Sign, email signatures get distributed directly to the end user's PC / device, letting them see and choose the signature as they type their mail. It works with Outlook, OWA, Office 365 Cloud and Blackberry. An additional app is required for iOS and Android. Modifications don't immediately take effect; signatures must be re-distributed. 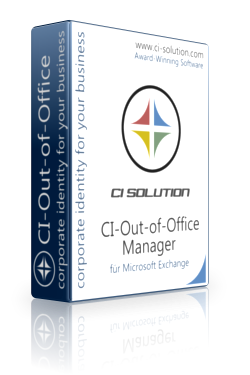 Server-side software such as CI-Mail-Policy runs as a service on your Microsoft Exchange Server. It takes action on emails, like adding a disclaimer / signature, while they are in transit. As the action is taken on your Exchange Server, this approach is completely device independent. Therefore (see above) less flexible than distributed signatures. Both types of software allow central management and full control over the design of email signatures, which is fundamental for dedicated email signature software. The main difference is where the action takes place. Server side software acts on emails as they pass the exchange server. It is therefore device independent. But, as signatures are added in transit, the users can't see or choose the signature when they type their email. The main advantage of distributed email signatures is that users can see the signature as they type their mail. You can provide any user with multiple signatures from which they can choose the right one for the occasion. You mainly have PCs / laptops / devices with Outlook. You use OWA and/or Office 365 Cloud. You have a lot of mobile devices. You want to ensure that every applicable email will get a (legal) disclaimer appended. You want to prevent users from editing or removing the signature. Yes. Combine both types of software to get highest possible performance and completeness. Distribute signatures to all clients with Outlook, OWA, Office 365 Cloud or Blackberry with CI-Sign so your employees can see and choose the right signature for the occasion. Let CI-Mail-Policy take care of mobile devices and ensure that all applicable emails get a legal disclaimer appended. Learn more about CI-Sign, our distributed email signature software for Outlook, OWA, Office 365 Cloud, Kerio and Blackberry. Learn more about CI-Mail-Policy, our disclaimer and signature software for Microsoft Exchange Servers. We'd be glad to answer any question. Send us an email at info@ci-solution.com.